The King's Head has truly risen like a phoenix from the ashes. 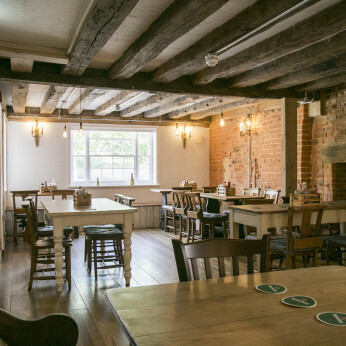 Owner Richard King has invested heavily in a major restoration project, which uncovered much of the late medieval fabric of the pub, which had been built over in Victorian times. The feature area of the pub has a prominent inglenook fireplace with log burning stove. The bar area has been modernised and would not look out of place in a fashionable London pub. The varied menu of good, home-cooked food will suit all tastes. There is a light, airy conservatory, as well as a large courtyard and garden area. COME AND SING YOUR FAVOURITE SONG, AND HELP US CELEBRATE HARRY BUSCALLS ACHIEVEMENT IN RUNNING IN THE LONDON MARATHON FOR TEENAGE CANCER TRUST! LIVE MUSIC EASTER SUNDAY WITH MICHAEL ‘TUBSY’ JOSLIN. COME ALONG AND JOIN US FROM 7PM!